Although there was a time when I thought it was. Back in my idealistic youth, before we had kids, adoption was our Plan B. “If we can’t have children, we’ll…” and all that. Truth be told, I was bloody scared that we wouldn’t be able to have children – because then we’d have to face the messy reality of adoption, and I wasn’t sure if I could cope. When we found out we were expecting Mister, I let out a huge inward sigh of relief. Now we could continue ignoring the A word. Back then, adoption was only a Plan B – something you considered only when all other doors had been slammed in your face. In my naivety – and I’m incredibly ashamed to write this now – I would wonder why childless couples didn’t ‘just adopt’, as if it were akin to popping to the Post Office for a book of stamps. If this is you, please know that I feel so terribly sorry for this attitude, which came from an immature, misinformed position, and not from a desire to be accusatory or hurtful. Infertility is painful enough, without idiots like me putting unrealistic expectations on you. And whilst, for many couples, infertility can be the trigger which gets them thinking about, and eventually excited about, adoption, it is not a given that just because you can’t have children naturally, you will automatically be in a mental, emotional, social and financial position to adopt. And, of course, you may just not want to – and that’s fine. Adoption is a big ask. It is certainly not Plan B. For us, adoption has become Plan A. And I’m always expecting people to ask us why we’re not planning any more birth children, but they never do. Perhaps they think it’s too personal? Perhaps they’re worried that there’ll be some medical details which will be just a little too gross? Or perhaps they genuinely don’t care? Whatever the reason, I can’t believe people aren’t just a teeny bit curious. The truth is, I’ve been fortunate enough to have fairly easy pregnancies and labours. There have been no conception problems in the past, and no reason to believe there would be in the future. We could withdraw at any point of this adoption process, and, to the best of our knowledge, find ourselves expecting – naturally – within a few months. We are not adopted, nor do we have any adoption in the family. In short, our motivation to adopt is not based on any practical, medical or historical reasons. Our motivation has, in fact, come from the sense that God is calling us to expand our family in this way. Adoption was always God’s Plan A for bringing human beings into His heavenly family – and so He calls many people to consider it as a Plan A for their earthly family too. We don’t expect this to be perfectly understandable to those without a faith, but there it is, and we can’t change it. Let me try to explain how we feel about pursuing adoption. We feel as excited as we did when we were expecting our two birth children. We have no qualms about being able to love all of our children, birth or adopted, equally. We don’t see adoption as ‘parenting someone else’s child’. Although God hasn’t actually closed my womb (to the best of my knowledge), it wouldn’t feel right to try and conceive again. It feels like the most natural thing in the world to have a child by adoption. None of these feelings would be true if God hadn’t intervened to change our hearts and minds on the matter. Adoption was Plan B. Now it’s Plan A. Thank you for this – it’s good to hear your motivation. One thought, though, as an adoptive mother myself. 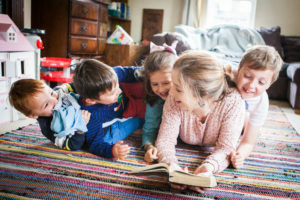 You will be “parenting someone else’s child.” It is vitally important that the child understands their background, their origins and their old family. They were not born to you, they were chosen by you. Whether you want to differentiate or not – adopted children are different. I love my kids as much as I would if if given birth to them. I didn’t. They need to understand that as it will help them trust my love for them. Thanks Kaye for your clarification 🙂 Great to hear from someone already on the journey of being an adoptive mum. I suppose I see it in terms of two families – our new child will have their birth family, and they will have their adoptive family. I’m not underestimating the impact that that separation will have had on them, rather I’m hoping that they will know that, although not born to us, they are ‘ours’ in the sense of having been chosen and loved and brought up and supported by us. With that particular statement, I was also thinking of a sad story I read recently, about a family who had decorated their adopted daughter’s room for her birthday – involving her in the colours and furniture etc. When the grandmother came in she said “What a lovely room for someone else’s child!”. Obviously I hope this is an extreme case, and that most people would have the tact not to say it, but even so, I do want my children to know that they are loved and wanted, whatever their background. Love this! This is exactly how I feel about adoption. 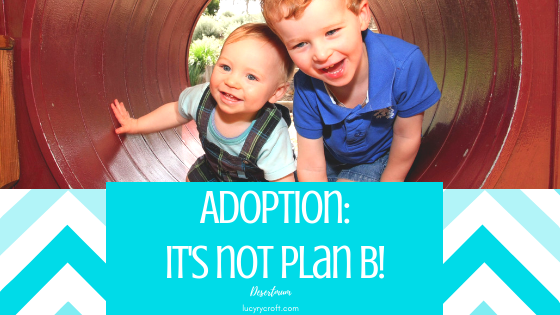 You don’t know me, I found your blog by googling “adoption not a plan b” because over the last few months I have been getting more and more excited about adoption. I have a 18 month old son and to the best of my knowledge it’s no problem for us to have more children. We just really really really want to adopt.